My dear friend and colleague Steven H. Silberg visited my 480 Photo Portfolio Development course last night at Stevenson University to talk about his work and offer insight into how he chooses work and presents his own portfolio. In addition to being a prolific cross- and multi-media artist, Steve is a Lecturer in Foundations, concentrating in photography and video, at University of Maryland, Baltimore County (UMBC) and the winner of the Washington Post’s 2010 Real Art DC competition. His work can be found at stevenhsilberg.com. 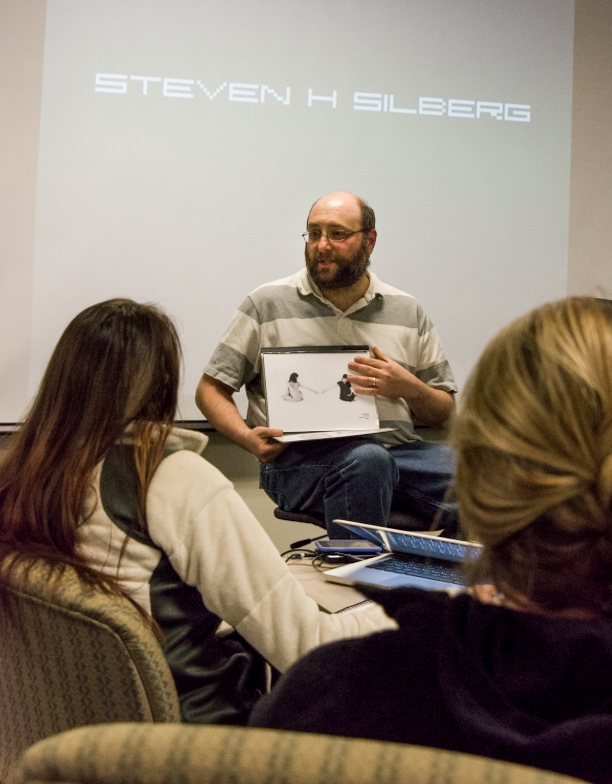 UMBC Lecturer Steven H. Silberg shows an example of one of his early-career physical portfolios to students in the 480 Photo Portfolio Development course at Stevenson University Feb. 25.